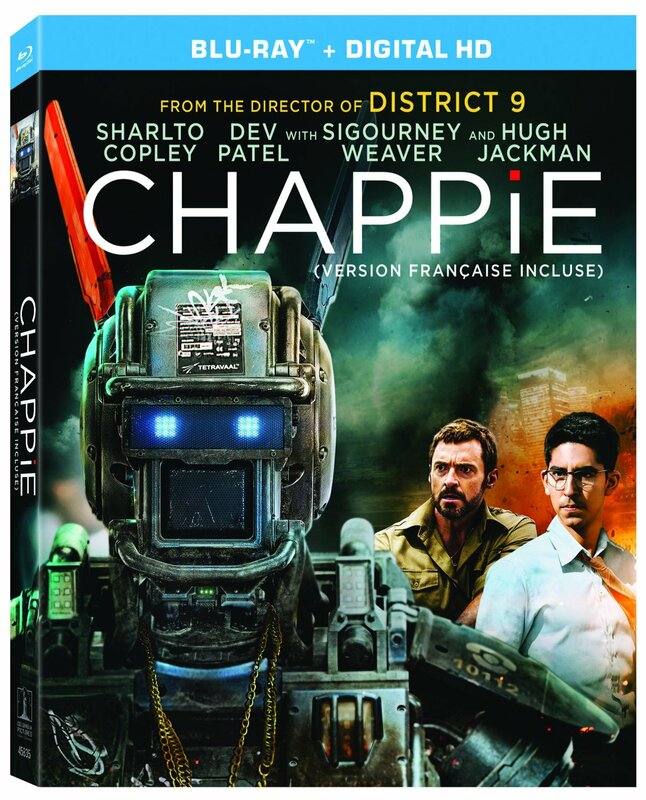 Today, Sony Pictures is releasing the recent science fiction film Chappie on Blu-ray. Deon Wilson (Dev Patel) is a computer engineer in South Africa, who helped launch the world’s first robotic police force. But when he steals a broken droid and creates a sentient machine, the invention named Chappie (Sharlto Copley) gets hijacked by a violent gang, who plan on using him to pull off a heist. There’s also company rival Vincent Moore (Hugh Jackman) to contend with, a religious zealot hellbent on proving that artificial intelligence is dangerous. Although Chappie strives for intelligent realism, the singularity seems more silly than serious in this film, which continues to squander the genuine promise that director Neill Blomkamp showed with his Oscar-nominated debut District 9. Although there are some theoretically interesting ideas at play here, the whole thing feels a bit ridiculous right from the start, with the dialogue and characters often seeming more like self parody than original science fiction vision. The philosophical undertones are mostly painted in broad strokes, the cinematography feels overly glossy for this sort of thing, and the mind numbing action sequences are like something out of a video game. It’s not really boring, but also could and should have been a whole lot better, making it very hard to give the thematically messy Chappie any real credence. The Blu-ray includes an alternate ending and extended scene, as well as multiple featurettes. Chappie is 120 minutes and rated 14A.